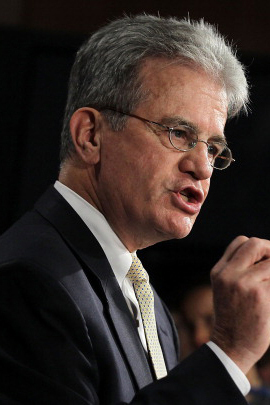 Tom Coburn, M.D. is the Nick Ohnell Fellow at the Manhattan Institute and advisor to MI's Project FDA. Dr. Coburn recently retired from the U.S. Senate after serving two terms from 2005–2015 representing the state of Oklahoma. In the Senate, Dr. Coburn was the ranking member of the Committee on Homeland Security and also served on the committees on Banking, Housing, and Urban Affairs; Health, Education, Labor, and Pensions; and Intelligence. From 1995–2001, Dr. Coburn represented Oklahoma's 2nd Congressional District in the U.S. House of Representatives. A family physician, Coburn was a Member of the Committee on Commerce where he sat on the subcommittees on Health & Environment as vice-chairman, Energy & Power, and Oversight and Investigations. Coburn was also selected co-chair of the President's Advisory Council on HIV/AIDS in 2001. A longtime advocate of FDA reform, Dr. Coburn introduced the "Promoting Accountability, Transparency, Innovation, Efficiency, and Timeliness at FDA" act with Senator Richard Burr in 2012. Dr. Coburn continued to see patients while he served in Congress. Dr. Coburn is a graduate of Oklahoma State University and University of Oklahoma Medical School. His specializations are family medicine, obstetrics, and allergy. He is the co-author of The Debt Bomb: A Bold Plan to Stop Washington from Bankrupting America (Thomas Nelson, 2012).